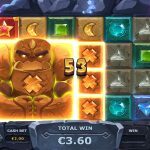 Gem Rocks is a video slot game that comes from Yggdrasil that we play as often as we can. This is a very innovative game where we have 6 reels and an impressive number of pay lines 4096. When it comes to the theme we have the usual gems but this time they are hidden in rocks so you have to work a bit to take them home with you. 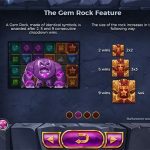 There are no bonus symbols in Gem Rocks like wilds and scatters but that does not mean that the game has nothing to offer. It is all about the game play here. We have the Dropdown Wins here which is the same as the very popular Cascading Reels that other providers use. This means that every time there is a win all the symbols that are part of the same will disappear and they will be replaced with new ones. This will allow you many new chances to land some wins. And this process can continue until there are no more wins. After certain number of wins a larger symbol will fall on the reels, between 2×2 and 4×4. 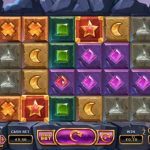 Gem Rocks is a very interesting game that we warmly recommend. This time we have a game from Yggdrasil which is fairly a new provider but it has a good reputation. The game play is nice and straightforward and there are plenty of opportunities that will allow you to land some good wins. Thanks to the Dropdown Wins it seems like you are playing free spins over and over again. We really enjoyed playing this slot and for that reason we highly advise you to give it a chance. No matter what kind of a player you are, if you are into good wins you will love this game. For another great engaging slot you should consider playing Easter Island a 5 reel slot by Yggdrasil.